Weight loss plateaus can be frustrating, and can even make you a little crazy. Typically, a plateau happens when you get down to that last 10 lbs, or when you drop a lost of weight and you hit the “good” body fat category. This might not be enough and you still want to get further and move even lower, from the “fitness” region for body fat in to the “athletic” region for body fat. So how do I lose that last 10 lbs? How does your metabolism decrease even though you are working out and dieting? This happens naturally when you cut back on calories. If you slash your calories too severely, your body will go into a starvation response. With a calorie-cutback, your body’s adaptive thermogenesis mechanism slows down and you burn less because you are providing not enough calories to keep the metabolic response high. It’s your body’s way of avoiding starvation. Think about a bonfire. The less wood you feed it, the smaller the flame. The more frequently you feed the fire, the better it will burn. You lost the first 10 lbs. Now you are at standstill. Calorie needs correlate one to one to your body weight and activity level. When you stand still, you do provide the calories that your body needs to stay at that the current weight. Size also matters: If you are a smaller person, you need fewer calories. Also your basal metabolic resting rate is lower because you are smaller. If you diet only, without exercise, you will lose lean muscle tissue in the process. 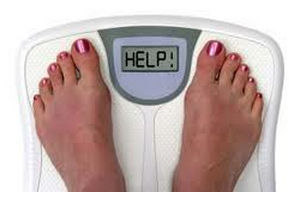 The loss of lean body mass will lower your Basal Metabolic rate. Lean muscle tissue increases your Basal Metabolic level. Yet, too few calories, slows it down. Try it out. Take a 10-lb weight and start walking the stairs for 10 flights. Then set them down and do the same. It is easier to move without the additional weight, right? At the same time, you work with less intensity, therefore you burn fewer calories. A plateau can happen when you work less intensely and you’re feeding a smaller body. Your original approach–to start and stick with an activity program–achieved results. Your weight dropped and you continue with the same activity program that achieved your current weight. The activity level of your program is affecting your weight-loss efforts. When you lose weight, you need to monitor the intensity levels of your workouts so that you don’t do the same program for the long term. This will result in no variety and no external stimuli for your body to gain muscle tissue, which in turn, increases your metabolism. Two workouts per week got the ball rolling. Your calorie intake follows that 2-day per week activity level. A calorie deficit is still your goal objective when you want to lose weight. Since you are on a standstill, you are maintaining your body weight with your current activity program. You can create a calorie deficit two ways: increase your workout and eat less. As you know, when you eat already below 1200 calories (for women) or 1800 (for men) your body will go into a starvation mode. So I don’t recommend reducing your calories even further. Studies have confirmed that individuals have their calorie counts off. Some experts say that you don’t need to count calories when you try to lose weight. I agree with this approach IF you start to focus on eating more on fibrous carbohydrates and increasing your protein instead of processed foods. However, at one point this will not be enough when you want to lose the last 10 lbs. You do need to be aware of how many calories you eat if you want to accomplish this. Studies have confirmed that many individuals who believed to eat 1500 calories really eat 1800. Scientifically, at this stage, your body does everything to get you off your diet and try to get your weight to stabilize. It is natural for your body to increase your appetite and heighten your senses to trick you into eating more. You have noticed this: The more you cut your calories, diet for a long period, the more your body is trying to hold onto your current weight. Take a big breath and reanalyze, reestablish and stay focused. Being stressed in this situation doesn’t help. Quite the opposite. Your body releases hormones that will slow your fat metabolism and help you to hold on even more strongly to the last 10 lbs. This is your first strategy: take a big breath and bring your calorie intake back up to maintenance level and out of calorie deficit. By doing this, your body will adjust and start to reset the starvation hormones that slow down your metabolism. Do this for about one week. Start again to drop down into a calorie deficit and pay close attention to how many calories you consume. To fool your body not to go into starvation, your second strategy is to go 3 days into a calorie deficit and the 4th day to maintenance level. This will prevent your body from going into starvation mood. Reevaluate your calories. Do you eat more then you should in order to create a calorie deficit? Simply increase your cardio’s intensity level. This will help you to create again your calorie deficit. Increase the duration of your cardio program. Have fun with it and mix it up. Call a workout partner and schedule workouts together so that you can increase not just length but also add additional resistance to your program. Make smarter nutrition choices. The key is to eat volume in food so you can eat more without gaining weight. Increase your fibrous carbohydrates instead of your starchy carbohydrates. Fibrous carbs provide you more nutrients and are less calorie dense than starchy carbs. This will help you maintain and increase your calorie deficit. There is more then one strategy to break through your weight loss plateau. The best approach is to combine many strategies—not just one– to accomplish your weight goals. And lastly, stay focused and expect success. P.S. : You will learn more strategies about how to break though your weight loss plateaus in the book www.AlpineWeightLossSecrets.com. P.S.S. : Need personal help? Check out the www.EasyAndSimpleWeightLoss.com. We have 2 spots left.